This page is currently under construction as we migrate off our old Codeplex page is still on Codeplex. Any calculated members which are part of the Analysis Service cube on the server can be added to PivotTables. But there is no built-in UI to define your own MDX calculations. Adding extra Excel calculations in the cells surrounding the PivotTable has some limitations as they are not part of the PivotTable and can be wiped out if the dimensions of the PivotTable change, and plain Excel calculations must only operate on data visible in the PivotTable. For help with advanced calculation properties for these private PivotTable calculations, or for help with MDX expressions, refer to our Calculations Help page. Thankfully, in Excel 2013 Microsoft does provide a UI for building MDX calculations for the first time. It even includes a drag and drop field and function list. 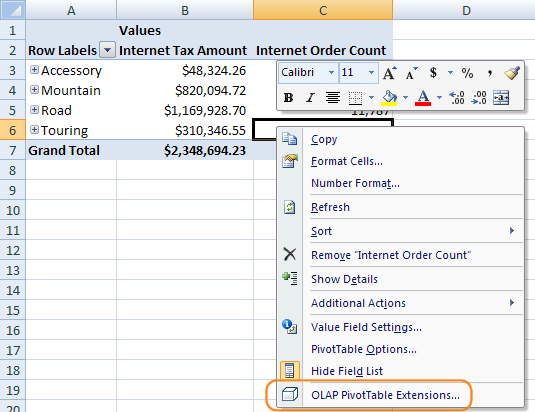 So use OLAP PivotTable Extensions in Excel 2013 for some of the other features it offers, which are detailed below. 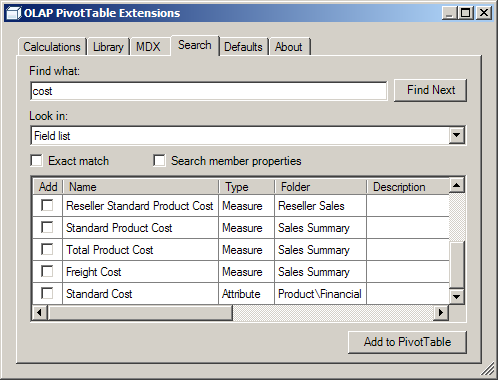 Unfortunately, Excel 2013 removed support for adding MDX calculated measures to PivotTables on Power Pivot models. Best Practice: In order to ensure a single version of the truth, it is a best practice to define important calculations as part of the cube source code. But some calculations like simple ratios or differences may clutter the cube and may be more appropriate if defined in the PivotTable itself. In addition, certain ad hoc research or prototyping may be more appropriate to be done as calculations private to a PivotTable until they are finalized and are ready to be added to the cube source code. 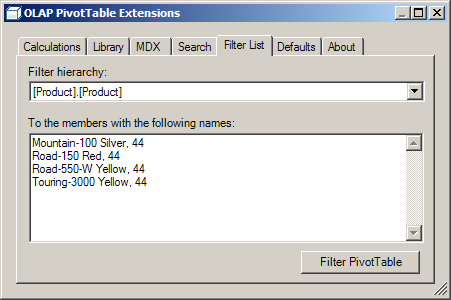 If a PivotTable is performing poorly or returning incorrect numbers, it may be necessary for the Analysis Services administrator to troubleshoot the MDX query which the PivotTable is using. 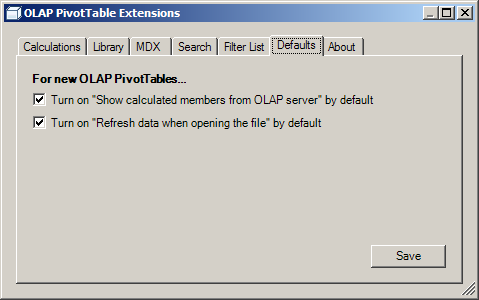 The MDX tab of the OLAP PivotTable Extensions dialog shows you this MDX. Starting with release 0.7.3, you can check the checkbox in the top right in order to send your MDX query to a web service for formatting, thanks to Nick Medveditskov. Note: This web service is currently down with no ETL on when it will be back up. The MDX is exactly what is sent to the server with one exception. Any private calculations you’ve created for your PivotTable are defined as session calculated members. 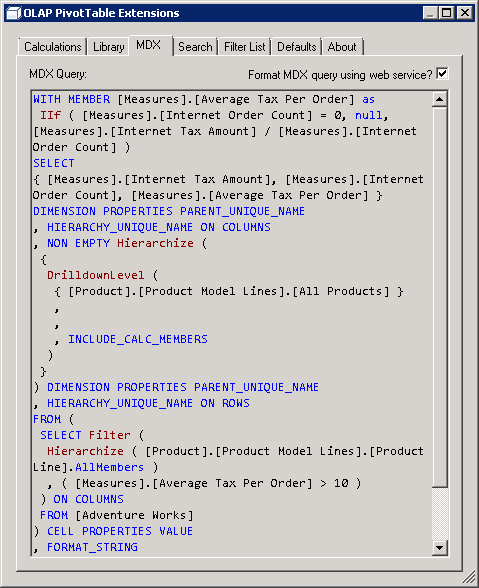 The MDX query exposed on the MDX tab displays the formulas for these calculations as query calculated members in the WITH clause of the MDX query. This allows an administrator to copy and paste the MDX query and troubleshoot it more easily in Management Studio or MDX Studio. Note that Excel 2016 added a new options screen where you can set many more PivotTable formatting and functional defaults. Finding what you’re looking for in a cube can sometimes be challenging, but the Search feature of OLAP PivotTable Extensions can help. It lets you text search the items in the Field List and their descriptions. It also lets you text search the dimension members in your cube. For more detailed information about the Search feature, see the dedicated Search page. 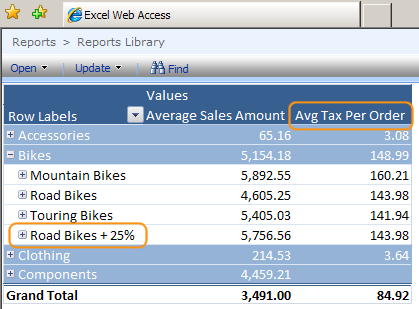 OLAP PivotTable Extensions need only be installed on computers which need to create new private PivotTable calculations. 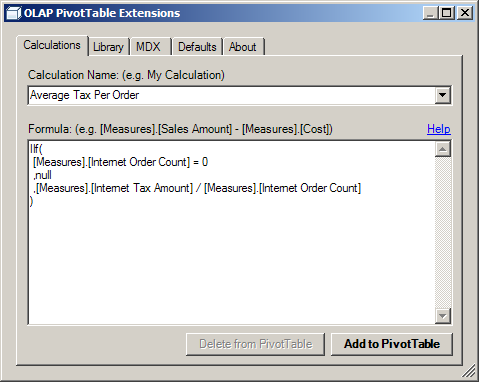 After those calculations have been defined, the PivotTable can be distributed to others without problem. If you distribute the Excel workbook to other Excel users, they will be able to continue designing and manipulating that PivotTable without problem. 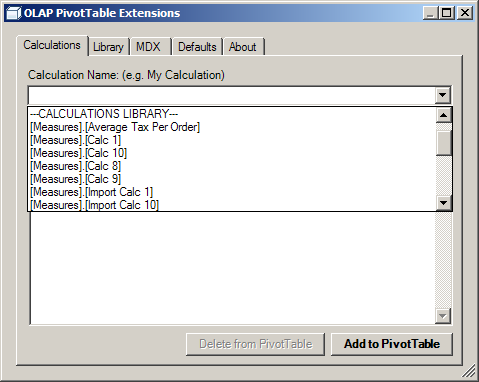 If published to Excel Services, the private calculations you define will still be active in the PivotTable. 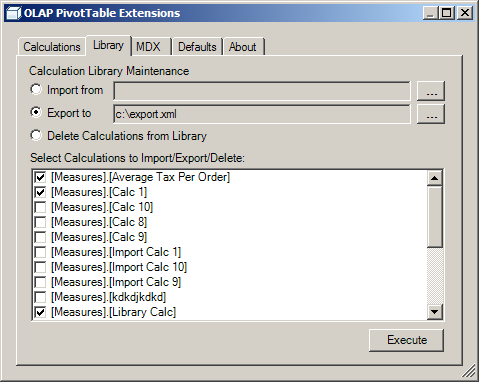 The Calculation Library does not need to be distributed unless other users wish to start brand new PivotTables and reuse certain calculations you have created using OLAP PivotTable Extensions. Using Excel 2007/2010/2013/2016 and OLAP PivotTable Extensions to edit an Excel 2003 format .xls workbook with a PivotTable and add a private calculated member will work. This PivotTable can be saved and distributed to users of Excel 2003 and the private calculated member will show up and work. Excel 2013 or Excel 2016 is required. For older versions, see the last release to support Excel 2007 and Excel 2010. NET Framework version 4.5.2 is required. If OLAP PivotTable Extensions is not visible in Excel, please consult the Troubleshooting Installation page. To report bugs or suggestions, please post an item to the Issues List tab. To ask questions about MDX formulas such as the formulas used for private PivotTable calculations, see our Calculations Help page, or post a question to the MDX tag on StackOverflow or the Microsoft Analysis Services Forum, or contact your Analysis Services administrator. For links to other resources about PivotTables, view our Acknowledgments and Additional Information page.